ELECTRIC FIRE FROM THE CLOUDS OFFERS THE PURCHASER an interesting way to reflect their taste in their own copy. After showing and selling a few of these books (as well as other limited editions that offered variations), it seemed clear to us that collectors actually enjoyed selecting the variables that would determine their unique copy. We decided to do just that and let the buyer choose the 10 “ink pulls” that will then be printed with text and hand bound for their enjoyment. What is an ink pull? A DOMINANT ELEMENT of Electric Fire from the Clouds is the page backgrounds. We call them ink pulls. These started out as a way to remove ink quickly from our Vandercook presses when cleaning rollers between colors. Drizzling solvent on the inked rollers, we would hand feed a sheet of paper through the rollers to remove the bulk of the ink. With some practice, we started being able to loosely control the look. Over time we built up a few hundred sheets, experimenting by overlaying different ink colors. For Electric Fire from the Clouds, the ink pulls are executed in white ink on heavy black paper stock. As a distinguishing element from book to book, we let each ink pull suggest where the type should go. THE PURCHASER CHOOSES which 10 ink pulls (backgrounds) they want in their book. 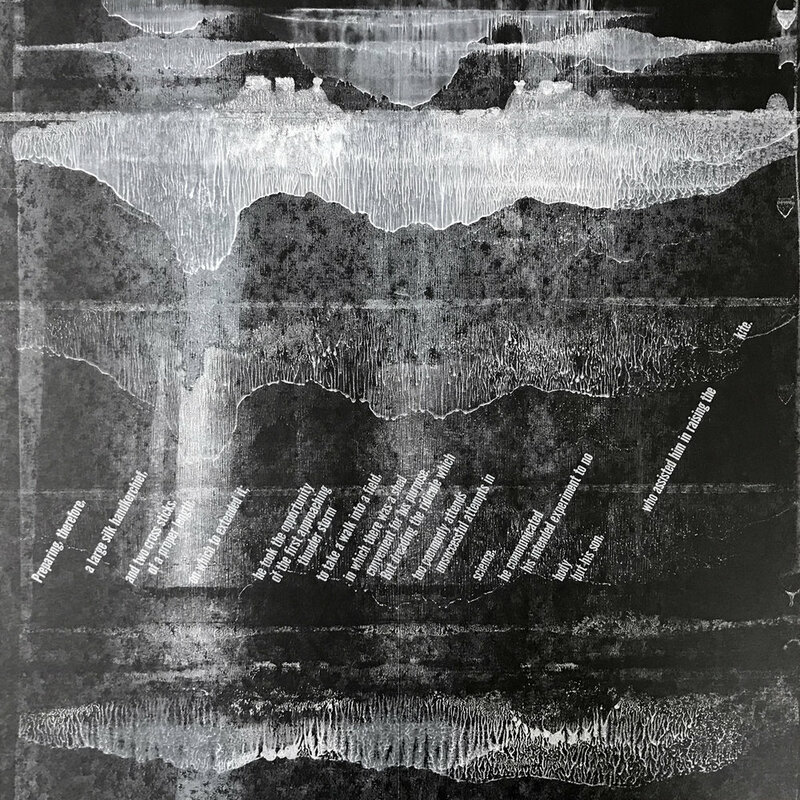 The text has a flow to it, sometimes suggesting a calm or subdued environment (Ben Franklin setting up and waiting for the storm to start, and another point where despair sets in). In other instances the text is concerned with the storm’s intensity (feeling the tingle of the spark in his fingers). We’ve determined there is a need for 5 “calm” sheets (A sheets), and 5 “intense” sheets (B sheets). The first sheet below is an example of a calm sheet. The second one is an intense sheet. TO PURCHASE Electric Fire from the Clouds, you need to buy the “pulls” you need by linking to this shopping page. You will be selecting and purchasing 5 A sheets and 5 B sheets. The pages are sold for $120 each, making the overall cost of the book $1,200. For a better feel for the visuals, take a look at a brief film showing a page-through of Electric Fire from the Clouds. Lead Graffiti retains creative control of how the type is positioned within the image of each of your chosen background ink pulls. We will organize the 10 ink pulls you have chosen in the order we feel works best with the text. We will position and print the type on those 10 spreads the way we feel is best suggested by the backgrounds. Lead Graffiti also reserves the right to exchange an ink pull of our choice in the event of catastrophic problems during printing. CLICK HERE to choose the ink pulls for your copy of Electric Fire from the Clouds.